Click on the covers for more information, or to purchase a copy of The Revival. The Revival is fantasy adventure series that takes place in a post-Apocalyptic wasteland. It features a small group of ‘soldiers of circumstance’ who are struggling to survive in a dark and dangerous world that is ruled by an evil and tyrannical blue pygmy named Ego, who is obsessed with an ancient artifact that he believes will awaken a ‘long-dormant evil.’. The survivors are led by a woman named Red, and include a bear, a potato man, a deer-like satyr, and a mentally unstable girl. They seek the aid of a powerful magician in order to become ‘The Revival,’ and bring down Ego’s industrial empire, The Engine. The Revival has a tried and tested ‘rage against the machine’ premise, where a small number of the oppressed population rise up to challenge the evil military-industrial complex. That being said, I don’t know if I have ever seen this handled in quite the way that Tom Kyzviant does, where magic and fantasy elements are seamlessly integrated and properly balanced with post-apocalyptic and science fiction elements. This story also includes some bizarre species, quirky characters, and goofy moments to break up a mostly dark story. Quite a few chances were taken with this comic book, and they fortunately paid off. Readers are treated to an interesting story, with engaging dialogue and intriguing characters. All of the characters in this story are pretty good, but a couple really stand out, as they are polar opposites. There is big, blue, talking bear named Pessimist, who fully lives up to his name. He is pretty aggressive and has no problem telling it like it is. He is the heavy of the team, and has no problem mixing it up. There is also a very interesting story explaining how he received his scars. Rainbow is another interesting character. She is infatuated with colors and explosions, and saying that she is mentally unstable is probably an understatement. Her words and actions break tension of a pretty intense story, and bring some welcome moments of levity. She also breaks the fourth wall a few occasions, and interacts directly with the reader. She actually got me to laugh out loud on a couple of occasions (there is a great quote from Aliens 2, that most people will miss). Some say that good comic book story is driven by it’s main antagonist. Ego does not appear a lot in the first four issues, but when he does appear, he does make an impression. He has a great backstory, and his obsession with solving the ‘ancient artifact’ is curious to say the least. The art style hearkens back to the artwork that used to grace the pages of old-school fantasy novels, and late 1970’s-1980’s animation. The art has character, and the style is very fitting for the story. The colors were well utilized for the most part, but if there is any problem that I had with the overall visuals, its that some of the scenes were too dark. Although it was fitting to use deep blacks to set the tone for some scenes, the blacks were probably overused in some panels, making it difficult make out what was happening. The Revival series is off to a great start. 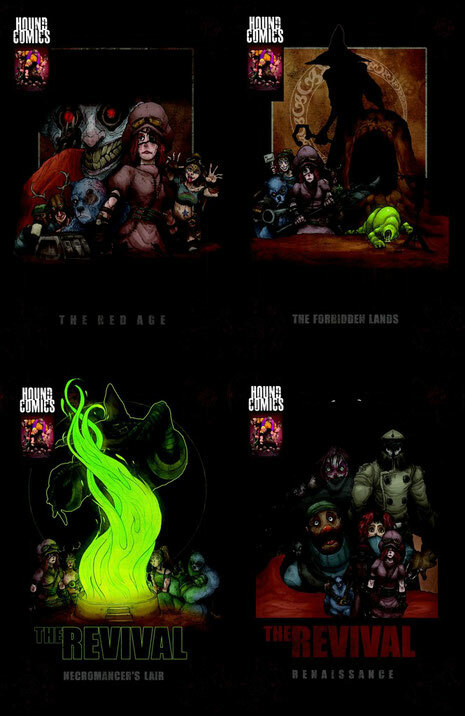 There appears to be some exciting developments in store for readers, so if you are a fan of fantasy, post-apocalyptic stories, then don't hesitate to pick up some copies of this comic book. You won’t be disappointed.